The Boreray originated on the island of Boreray which is in the St. Kilda group. The breed was developed during the late 19th century from Scottish Blackface and a Hebridean type of Old Scottish Shortwool. The breed has been largely feral since 1930. 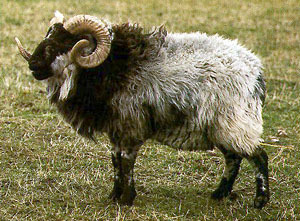 The Boreray is a small breed with no wool on face or lower legs. The extremities are black or tan colored. The fleece is white to light tan but occasionally an individual animal will be darker. Both sexes are horned. The ram's horns are large and spiraled. British Sheep and Wool, British Wool Marketing Board, Oak Mills, Station Rd., Clayton, Bradford. 112 pp.